In 2014's Guardians of the Galaxy, James Gunn introduced the world to a team of miscreants and misfits forced to come together and save the galaxy. To put it bluntly, they're a bunch of a-holes. With the sequel, titled Guardians of the Galaxy Vol. 2, the latest feature from Marvel Studios, the writer-director is tasked with delivering a story that not only continues the epic and irreverent adventures of Peter Quill (Chris Pratt) and his gang of lovable weirdos, but furthers their evolution as characters as well. Set to the '70s soft rock stylings of Awesome Mix Vol. 2, the sequel picks up a few months after the first film ended. After saving Xandar from Ronan the Accuser, the Guardians have become famous throughout the universe as world-class mercenaries, selling their services to the highest bidder. Ayesha (Elizabeth Debicki of The Man from U.N.C.L.E. and The Great Gatsby), the high priestess of a genetically perfect alien race known as the Sovereign, has hired the team to protect her planet and the valuable goods on it from an interdimensional beast. As payment, the priestess delivers the criminal Nebula (Karen Gillian), sister to Gamora (Zoe Saldana), to the Guardians so they can hand her over to Xandar's Nova Corps. This new business relationship is going great until Rocket (Bradley Cooper) steals a few of the planet's precious batteries on the way out, making an enemy out of the arrogant autocrat. 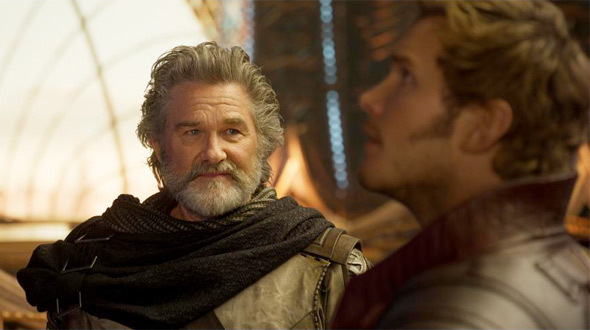 Pursued by the Sovereign fleet, the Guardians fly through a quantum asteroid field and end up crash-landing on an uninhabited world where they receive help from an unlikely source: Quill's long-lost father, Ego (Kurt Russell). As a celestial being and intergalactic explorer, Ego has been searching for his son for a very long time and wants to make up for lost time by recruiting Quill for an important mission. Likewise, since learning he is only part-human, Quill has been on a quest to unravel the mystery of his true parentage. He's dreamed his whole life that his father was somebody special—somebody important. When he finally meets his larger-than-life dad, it fills a planet-sized hole in his heart, but his bond with the other Guardians is strained. Kurt Russell, known for his iconic roles in films like Escape from New York, The Thing, and The Hateful Eight, is an exciting addition to the Marvel Cinematic Universe. Who better to play the father of a charming, sarcastic scoundrel than the veteran actor who captured both the cynical badassery of Snake Plissken and the laid-back swagger of Captain Ron? Russell delivers another memorable performance here and his chemistry with Pratt makes for a convincing father-son relationship that emotionally anchors the film. If the first movie was about a group of self-interested outsiders becoming a family, then Vol. 2 focuses on them being a family, and how hard it is to stick together when your inclination is to just push people away. Each member of the team is dealing with this in his or her own way. Rocket's journey is especially poignant as he comes to terms with the anger and emptiness inside himself, all while trying to take care of Baby Groot. Voiced again by Vin Diesel, the adorable little Groot doesn't have the memories of his adult form. Prone to temper tantrums, Baby Groot must grow up quickly to prove his worth to the team, who react to his newfound infancy in different ways—some good, some bad. Gamora, meanwhile, is working through her issues with Nebula while Drax (Dave Bautista) develops a friendship with another new addition to the cast, Pom Klemeneﬀ playing Mantis. An odd, insect-like alien with empathic abilities, Mantis can interpret the emotions of others. When she touches Drax, she feels the profound loss he has experienced. She understands Drax in a way few others do—they both see the world in a very literal, childlike way. It will be interesting to see how this relationship, and Mantis' role as a Guardian, plays out as the story continues in Guardians of the Galaxy Vol. 3. Every character is a diﬀerent person by the end of the movie, but it never feels forced. 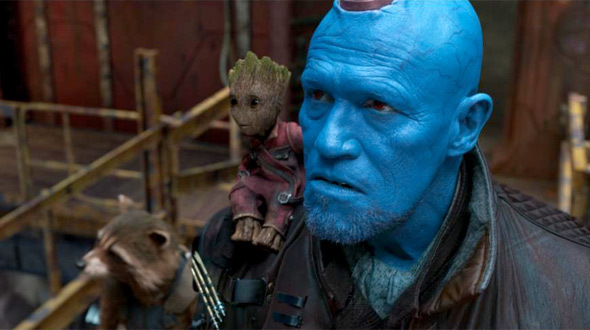 While writing the first film, Gunn couldn't write for a specific actor's voice because the script was still in development. Now that he's returning to this world with an established cast, he can write specifically for the actors involved. And because no one knows these characters' voices and rhythms like he does, Gunn can play to each actor's strengths, resulting in pitch-perfect performances and fully realized characters. Where Gunn's script falters, however, is when he strays from these organic character interactions and tries to cram Irreverent Humor™ and Witty Banter™ into every nook and cranny he can find. This happens more during the film's first act, where characters are in competition to one-up each other with increasingly crass punchlines in the hopes that one will find the mark. That's not to say Guardians of the Galaxy Vol. 2 isn't funny—it is—but the funniest moments happen when these opposing personalities bounce off each other naturally, not when the characters are subjecting us to their stand-up routines. Still, despite the occasional failed joke or forced pop culture reference, Guardians of the Galaxy Vol. 2 is a far out follow-up with exciting set pieces, eye-popping imagery, and dazzling special effects that take us into the far reaches of Marvel's infinitely interesting universe. I love spending time in this world with all these characters. It's not every day you see a movie about a wise-cracking raccoon and anthropomorphic tree baby and feel an emotional connection to them. That's the magic of these movies, that they transport us—however briefly—to a time when we could be affected by, and inspired by, stories of the fantastic, before the responsibilities and crushing realities of adulthood hampered our ability to believe in the impossible.